In today’s vlog, we try an easy to find cider by Hornsby’s. It’s not boring. And that’s good. Thanks for dropping in, and peace out my vegans! Here’s your lesson on yeast and fermentation as a bonus to this week’s cider review. Nice cider, Crispin! Hope you enjoy it, and enjoy yourselves! Peace out, my vegans. TV is back with a brand new addition. Something that’s been holding us tightly, just kidding it’s another cider review you can view nightly. 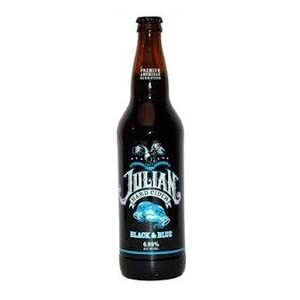 This time it’s Julian Hard Cider’s Black and Blue. It’s delicious. Happy VD Day, as my father would say. And as always… Peace out, my vegans. What’s new, gang? We’re awesome, thanks for asking! And we’re even more awesome than usual because we tried a new vegan, gluten-free beer. This particular brew comes from Lakefront Brewery and it is their New Grist sorghum and rice beer. It was pretty tasty. Behold our videotaped reaction (some may be NSFW). Thanks for checking out this vlog installment, and let us know if you want a Tempeh Strips shirt of your own! From Brent and Christie… Peace out, my vegans. We like cheese but don’t like how it affects cows, the environment or our bodies so we spend a lot of time here at Turning Veganese trying vegan cheeses. Check this link for some of our older reviews. We’ve been reviewing some mac and cheese varieties for you lovely people. I’ve had mac and cheese of one sort or another 5 times this week so I’m a little beleaguered; bear with me. 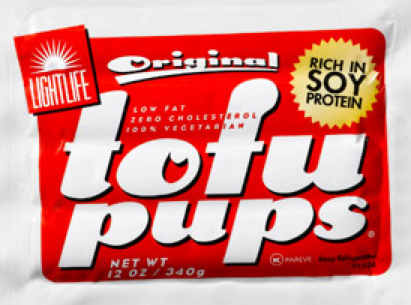 They’re all gluten free and vegan and we’re about to weigh in on how delicious they are and if they work well with our favorite addition: chopped tofu pups or tempeh and peas. 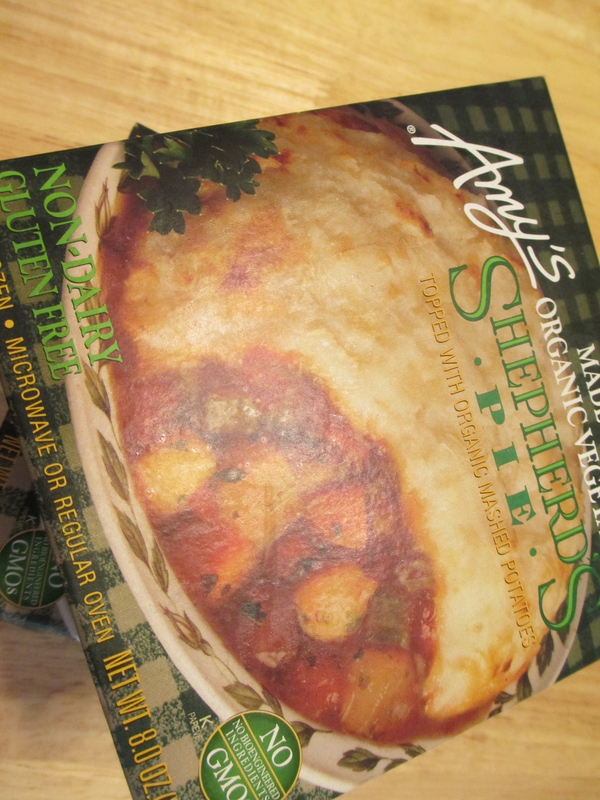 Amy’s This particular variety is frozen, so it’s preparation is slightly less complicated than the others. For me the beauty of boxed mac and cheese is that I can throw it in a bag for vacation and don’t have to worry about it spoiling, obviously this variety didn’t fit that criterion but it’s still mac and cheese that’s gluten-free and vegan so we’re giving it a shot. This particular variety has a whopping 520 calories per serving and didn’t seem like a big serving compared to some of the others we tried. The mac and cheese itself was gooey, cheesy and delicious probably due to Daiya. The dish benefited slightly from adding a touch of hot sauce and black pepper but that’s just how I roll. At $4.89 it is only slightly more expensive than the boxed varieties, but it only feeds one person before or after the addition of peas and tempeh. The serving size, calories, price and perishability didn’t outweigh the flavor, unfortunately. Leahey Gardens This is our old favorite and we were pleased that it stood up to the competition. It is remarkably low calorie, 97 calories per serving and there are three in the bag. The sauce is rich and creamy and definitely lightly cheesy. It was well seasoned and all I needed to add was a touch of flake red pepper, some chopped tofu pups and about 1/2 cup of thawed frozen peas. It cost us $3.09 per bag which is more than enough for 2 people or one hungry one. 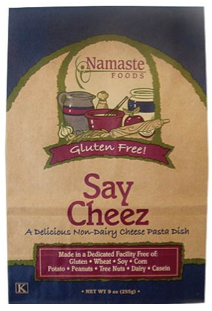 Namaste Foods Say Cheez non-dairy seasoned gluten-free pasta requires no non-dairy milk. Only oil and salt are necessary to make this pasta. The whole bag contains 4 servings, clocking in at 270 calories each. The ingredients are unobjectionable (notably hemp in included) until I get to the bottom of the list and they’ve added silicon dioxide; that’s sand for the less nerdy among us. I suppose I eat a little dirt every day but it seems unnecessary. The preparation is a little simpler – you cook the pasta, drain it and season it. It’s beautiful and smells great, though the sauce wasn’t convincing on its own. 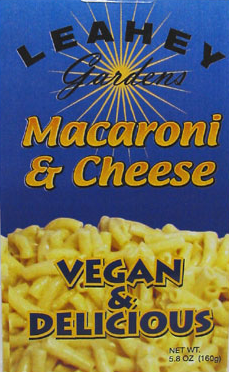 When we tasted it we were both a little disappointed: it tasted more like buttered noodles than mac and cheese. It did well with some damage control (the liberal addition of hot sauce of various varieties) but it’s definitely not mac and cheese. It cost $4.60 per package which was reasonable for the amount of food the package makes (almost too much for 2 people), just be warned it’s not what your mouth will be expecting with the advertisement of mac and cheese. Outdoor Herbivore Quinoa “Cheddar” Mac comes modestly packaged. The ingredients were unobjectionable and the preparation was a cinch: bring water to a boil, add the ingredients and let it sit for 10 minutes. The pasta wasn’t quite al dente after 10 minutes so I brought it back to a simmer and let it sit 3 more minutes. As we ate it I discovered a drawback of the preparation method which was an occasional piece of less than cooked pasta. I do admire the simplicity of the process conceptually, but it didn’t quite work. When it came to the dish itself, we were both disappointed: the sauce tasted like onion powder and nutritional yeast than mac and cheese. I do love those ingredients but it wasn’t mac and cheese and it wasn’t seasoned enough. With the addition of tofu pups, peas, cumin, coriander, paprika, Braag’s aminos, flake red pepper, Tapatio hot sauce and garlic salt it was awesome. It cost $9.99 so it’s as expensive as Amy’s to feed 2 people. It wasn’t really worth tracking down. Road’s End Organics We’re trying the alfredo style brown rice pasta dinner first. 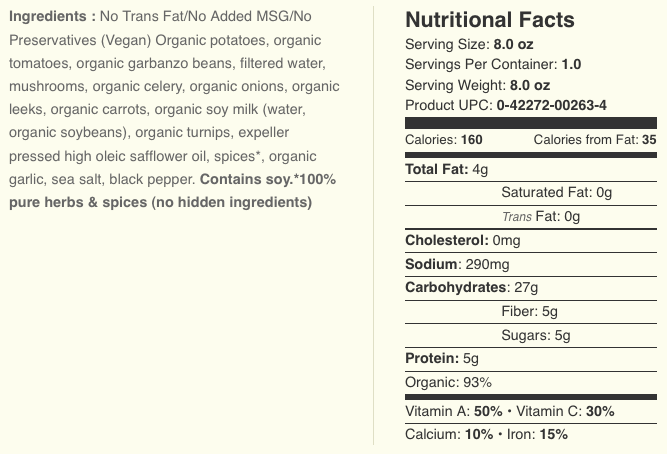 The whole box, prepared, contains 2 servings at 330 calories each and the ingredients are organic and enriched with some awesome B vitamins from nutritional yeast. The instructions were straightforward and required about 10 minutes cook time. Unadulterated, the pasta was bland and the texture of the sauce was grainy. It is alfredo so I suppose the sauce wasn’t supposed to be a cheesy thrill, but Brent had some choice words about the texture of the sauce. The pasta itself was nothing special but definitely not bad. With the addition of tofu pups and peas that I sauteed in basil canola oil with flake red pepper, paprika and garlic salt… it was awesome. For versatility it’s a “GO!” Next we’re getting into their mac and chreese. This one was also 2 servings at 330 calories each. The nutritional info and preparation are very similar. 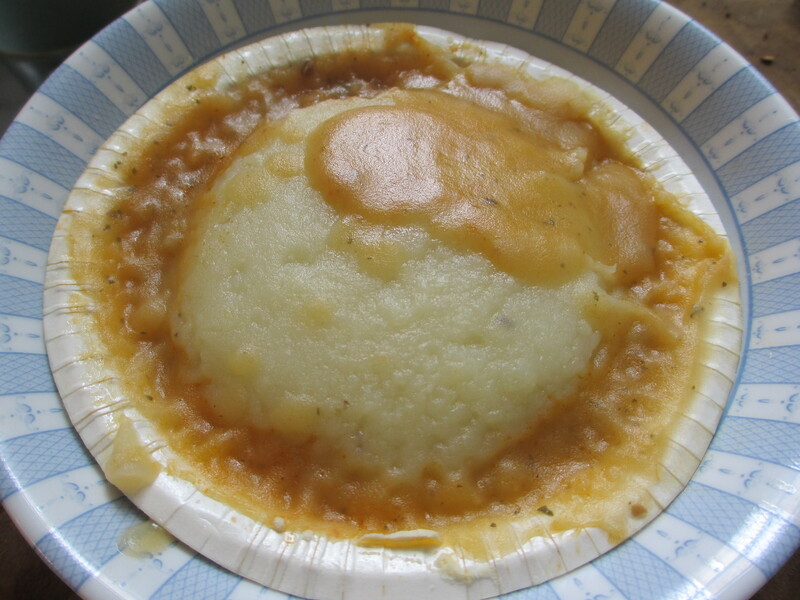 We liked this one almost as much as Leahey Gardens: it’s creamy, lightly cheesy and the sauce has a nice texture. It’s AWESOME with peas and tofu pups that were sauteed in basil olive oil with flake red pepper. Feeding 2 people or one hungry one at $3.59 made it a decent deal but I don’t think it can replace Leahey Gardens’ mac and cheese in our kitchen. Most of these brands offer wheat pasta varieties as well which will probably be cheaper than the gluten-free varieties and with the same delightful sauces which is what we’re really concerned about here, AMIRITE!?. Leahey Gardens was by far the cheapest and tastiest so if you come across it (we buy a few bags every time we order from VeganEssentials.com) TRY IT! 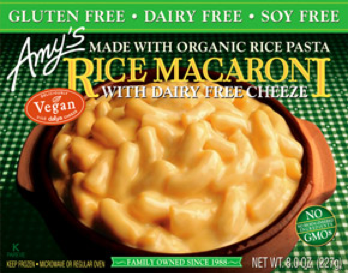 Our second choice was Road’s End Organics Mac and Chreese, cheddar style… skip the alfredo. Ahoy, gang! This time, we’re trying a sorghum beer called Redbridge. It’s kind of… well. Meh. When I go to Whole Foods these days, it’s usually because I’m on the hunt for something very specific that I can’t find anywhere else, or because it’s the most convenient place to go for certain items. Examples include Chicago Diner vegan desserts (which are available in Whole Foods stores throughout the Midwest) or a Field Roast or Tofurky frozen pizza (I want it when I want it). One really nice thing that Whole Foods does is offer coupons that are actually very decent deals. I end up trying new things because I have a coupon. 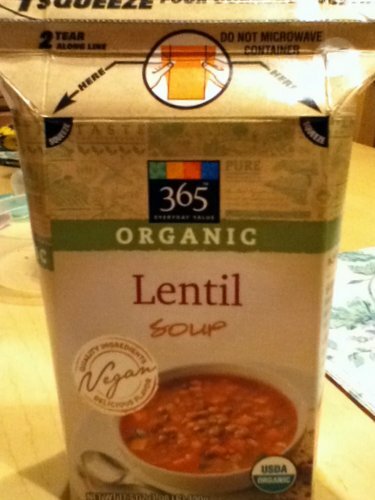 One new thing that I tried recently was 365 Organic Lentil Soup. I bought a 2-serving size “juice box” style package of the soup. The box isn’t resealable like most other soup boxes I had seen, so I had to split the contents into two containers which equaled two lunches. That was mildly annoying. It would have been nice to keep the box in the fridge at work. I will say that the packaging does have a clever way of being opened that results in zero to minimal mess and easy pouring. The soup itself tasted OK. One serving size was a perfect lunch portion for me. It had a decent amount of lentils with some carrots and celery in the mix. No extra seasoning was needed. All I had to do was heat it in the microwave for 1 1/2 to 2 minutes. It was a good meal, but nothing spectacular. It’s nothing more or less than what one would expect from a pre-packaged soup. I didn’t pay much attention to the ingredients but I did find myself wondering what preservatives were in there in order for the soup to stay fresh while it was sitting in my pantry for a month. Ahoy! We’re back again to show you another great vegan and gluten-free drink from our vlog series. In today’s review, Christie and I take a look at Spire Mountain Dark and Dry Cider. The cider is pretty darn tasty, and worth taking for a spin. Don’t forget, if you have a favorite you would like us to review, or if there is a beverage you would rather get some other fools to try for you, drop us a line!